The government has been criticised for receiving £268,000 from telephone benefit hotlines with the prefix 0845. Following a Freedom of Information Act request, the Department for Work and Pensions (DWP) said it had been "refunded" the money from the hotline. The Derbyshire Unemployed Workers Association (DUWA), which obtained the information, said it was "ridiculous" people had to pay to access benefits. In response, the DWP said it had met official guidance on call charging. The DWP operates about 2,000 hotlines. Some, such as the Pension Credit line, are free, while others with the prefix 0845 are designed to ensure a standard low cost call rate for all people calling from a landline phone. Charges on 0845 numbers can range between 1p and 3p per minute, the DWP said. However, calls from mobile phones can be charged at a higher rate. Colin Hampton, spokesman for DUWA, said that many people on benefits do not have telephone landlines, using mobile phones instead. 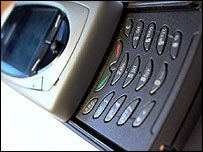 "Many benefit claimants use top-up mobile phones which can often charge more. "It's ridiculous that people have to pay to access their benefit entitlement," he said. Mr Hampton added that the government should ensure "this kind of thing can't happen". The DWP said its hotlines were key to making its services "accessible to all customers" and often saved claimants cash. "For example Jobseeker Direct (hotline) has found work for a third of a million people while saving them the time and expense of travelling to a Job Centre Plus," a DWP spokeswoman said. The spokeswoman added that its policy met "Cabinet Office guidance on call charging" and that if the DWP did operate freephone hotlines then calls from mobiles were still likely to incur a charge.